The Prince Bar recently introduced nightly food specials which run from Sunday to Thursday each week. On Sunday enjoy a ribs and wings combo, fresh fish and chips on a Monday, Tuesday is curry night, it’s burger club on Wednesday night. and steak club on Thursday! All of the Prince’s nightly specials are served from 4.30pm to 9.30pm with a drink of your choice. Conveniently located in the centre of Athlone town, The Prince Bar serves breakfast from 7.30am to 11.30am daily. Enjoy a traditional Irish breakfast, veggie breakfast, pancakes or a freshly baked scone from the in-house pastry kitchen. Have tea or coffee with your scone for only €3. The Prince is a popular spot at lunch-time, with a full carvery option available from 12 midday. Choose from a range of fresh delicious dinners or, if you fancy a light bite from the deli, enjoy sandwiches, wraps and salads, or warm up with some homemade soup. In a rush or fancy takeaway? Pre order by calling (090 ) 6476666 and it will be ready when you arrive at The Prince. Evening bar food is available from 4.30pm to 9.30pm nightly. 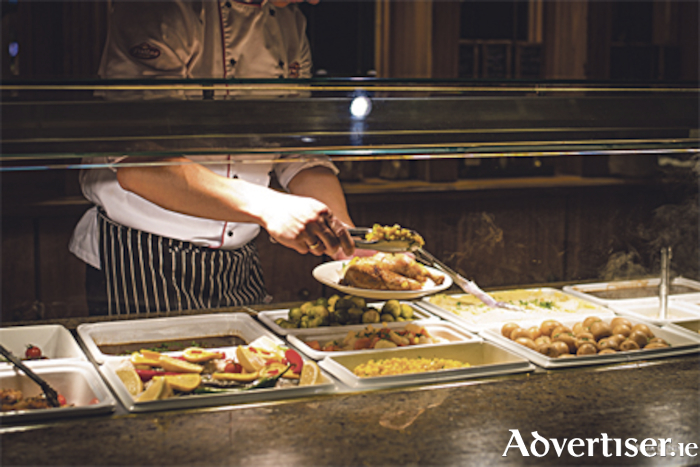 Whether you are looking for a hearty breakfast, a mouth-watering carvery lunch or a three-course dinner, The Prince Bar & Kitchen caters for everyone’s tastes and needs at an affordable price.